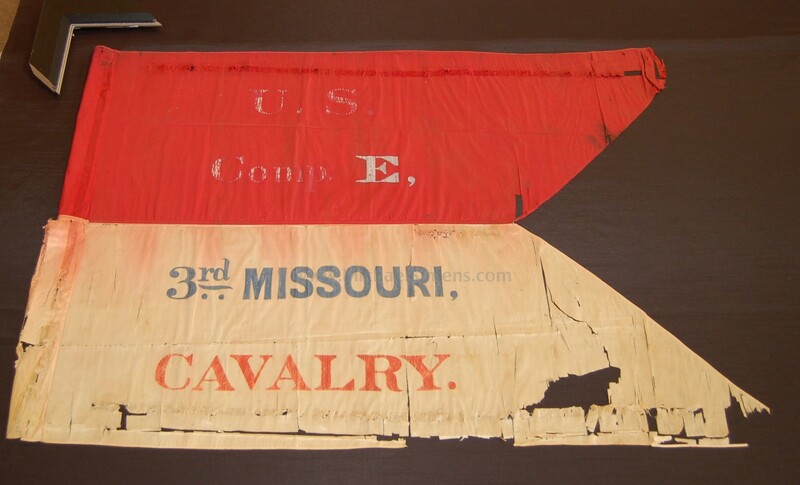 One of the Great Rarities of the Civil war is this U. S. Cavalry Regimental Guidon Cavalry Flag that was used by pre and post war Civil War Cavalry Units. This is an all silk, painted U.S. Army Red Over White Swallowtail Model 1833. 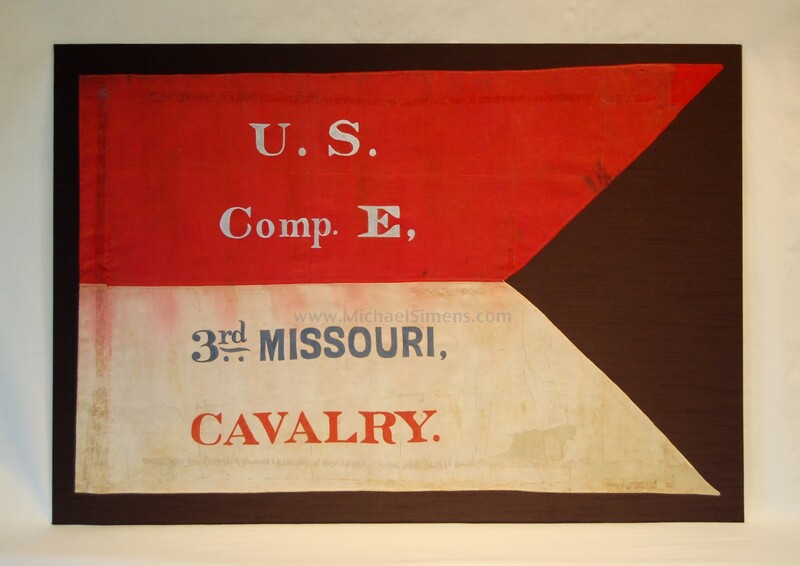 The U.S. Quartermaster’s Department provided guidons of this pattern to Mounted Troops from 1833 to 1861. Most of the guidons in stock in 1862 were modified to “Stars & Stripes” pattern guidons in February of 1862, but many of this pattern were issued for use to units that needed them early in the war. A few of this pattern were used prominently to include the famed "CALIFORNIA 100". 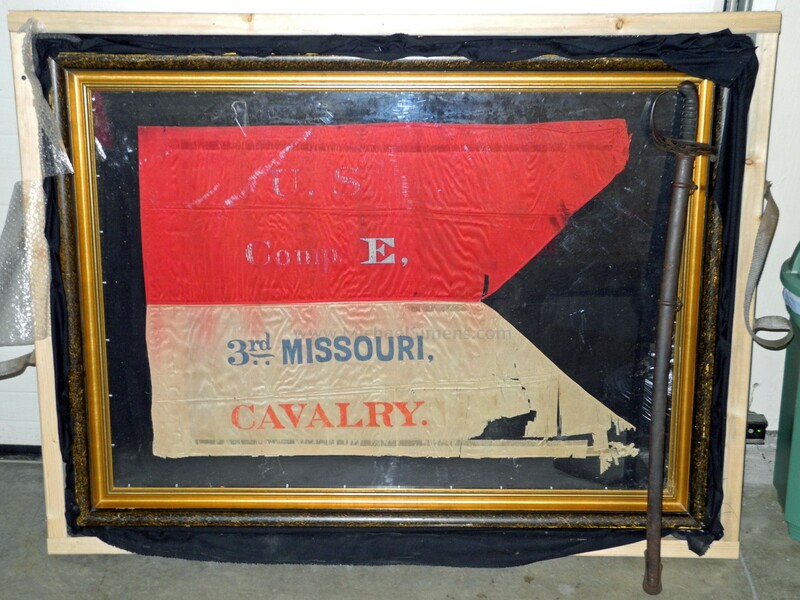 This particular flag of Company "E", 3rd Missouri Cavalry came to us in the frame as pictured along with the sword of Captain Thomas G. Black, eventually Lt. Colonel and commander of the 3rd Missouri Cavalry (see previous lot). As you can see in the first photo, this flag was pressure mounted, resulting in the usual sagging and cracking of the silk. We had it removed from its frame and mounted properly with all the tiny pieces of silk re-mounted to reveal a glorious and wonderfully attractive, completely conserved artifact. This regiment was organized in the fall of 1861. During the months of Dec., 1861, and Jan., 1862, it was engaged in the suppression of the guerrillas about Palmyra, defeating them at Mountain Store, Sinking creek, Wyman's mill, Newtonia, Hartville and other places. It continued its efforts throughout the war chasing raiders, guerrilla fighters and renegades throughout Missouri and Arkansas such as William "Bloody Bill" Anderson and William Quantrill. Blacks' Company "C" saw more casualties than any other Company in the Regiment. Colonel Black was obviously presented this flag upon leaving the service of his regiment.